It's no secret at this juncture that the fashion industry adores pretty young things—and we do mean that literally. Models nowadays get their start as young as just 14 or 15 years old, and if you flip through the pages of any major fashion magazine, you swiftly understand that women above a certain age are just not part of the club. This lack of diversity has been well discussed and is unfortunate—especially when there are so many beautiful older models out there! But some designers are starting to catch on; major brands like Ralph Lauren, Dolce & Gabbana and Céline have cast more mature women in their campaigns over the past few seasons. The tides seem to be changing, and every baby step counts—so here is our own little baby step we want to contribute. Gitte Lee, 81, was born in Copenhagen, and she began her career in modelling at the age of 26. 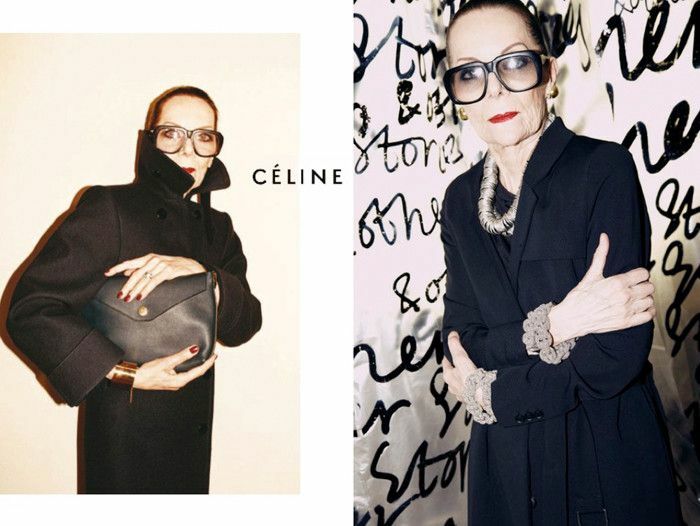 In 2010, Céline designer Phoebe Philo cast her as one of the stars in the Parisian brand's A/W 11 campaign. Lauren Hutton, 72, is widely considered an icon in the world of modelling. The American goddess has starred on the cover of Vogue a record-setting 26 times! Vogue recently profiled 87-year-old model China Machado on account of her prolific career and the life lessons she learned on the way. She received her start in Europe, where she was iconic fashion photographer Richard Avedon's collaborator and muse. Now, she has an entire exhibit in New York dedicated to her and her work, called A Muse Among Friends. Daphne Selfe, now 88, has been modelling since 1949. When she was just 20 years old, she landed the cover of a magazine in her native London. She is an outspoken voice for the older model set and has sworn she will never retire. American model Carmen Dell'Orefice, 85, is known by many in the fashion community as "officially" the world's oldest working model. She first appeared in American Vogue in 1946 and subsequently starred in its pages many times thereafter. Next up, the classic Chanel items every woman of every age would love to own.